Writing is hard work. For some students, that is a concept they fight tooth and nail. Their preferred process often looks something like this: rushed thoughts scribbled onto a template, convert to full sentences, hand it in, done. That’s why principle #1 is important. Technology can support the pre-writing process of brainstorming, modeling, and graphic organizers that bring out higher level thinking and student achievement in writing. In my classroom, once students have their graphic organizer completed, the “clouds” move in. Google Apps is an example of “cloud computing”, a techie term used to describe distant servers that store data. It’s a free online program, similar to Microsoft Office, which students can safely access from school and home. The apps include word processing, spreadsheet, presentations (Power Point) and form (useful to make quizzes). At the beginning of the year, each new student is set up with their own account, supplied by DDoc from the board’s Tech Team. Their account is designed with a username based on the school and a number instead of their real name (e.g. turnstudent01). Students who were in my gr. 7/8 class the previous year maintained their original account. 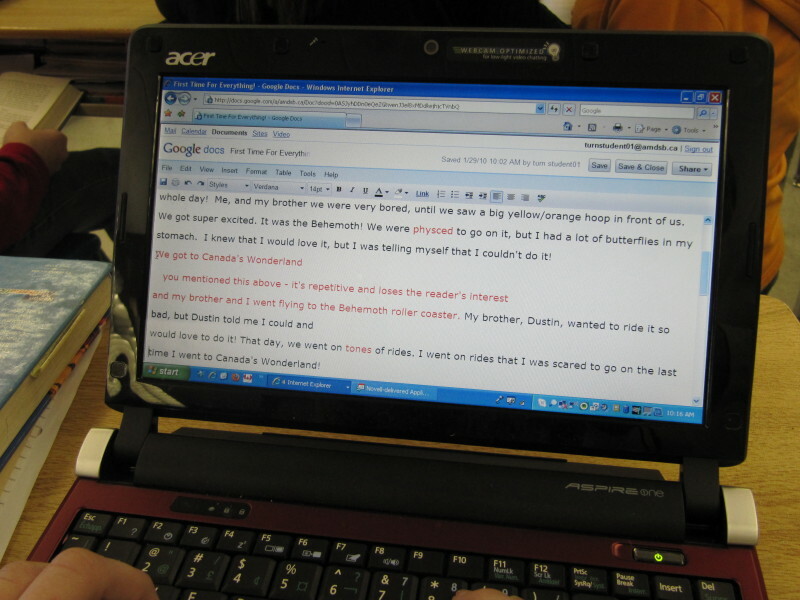 Using the word processing app (Google Docs), students type their first draft. They get a kick out of the fact that they are writing “online”. I know they are safe and no one other than me and their parents, can access their work. Principle #2 focuses on communicating and collaboration. In this example, that means peer editing. Once the initial draft is complete, students “share” their doc with two other students for peer editing. Using different coloured font, the peer editors type suggestions based on the rubric, a recent grammar lesson, or basically whatever needs to be added to help the” owner” of the document. Peer editors can write at the same time as the owner to speed up the process. Struggling writers who are linked with a stronger writer, get the chance to read some good examples before revising and editing their own. Effective peer editing takes time and comes with its own set of challenges. Over the past two years, I’ve learned that peer editors using Google Docs need constant training. We practice, practice, practice on how to constructively comment. Surprisingly to some, inappropriate comments are not an issue, lack of constructive criticism is (perhaps not wanting to hurt someone’s feelings?). So we practice some more, emphasizing the fact that you’re helping your peer when you give specific feedback so the owner can edit before I see it. “Great job” doesn’t cut it. I’ve also learned this lesson needs constant reviewing. Sometimes students don’t buy in. They couldn’t care less about another student’s writing. They are not yet sold on the importance of developing “communication and collaboration” skills. As a result, I sometimes assess students on their own peer-editing skills. That usually convinces them buy in. The peer-editing groups are changed each term. I align them based on strengths and struggles, ensuring strong and struggling students each receive some constructive peer feedback. Sometimes students, no matter how clear you make it, will not follow a rubric. Having a peer comment on their work seems to help. “You got to add..……to get a better mark. You know Mrs. D will tell you the same thing”. 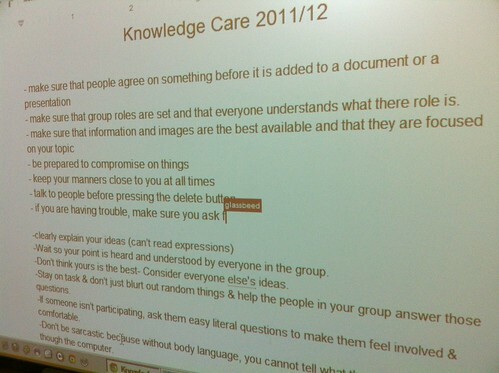 The beauty of networking with other students using Google Docs supports principle #3. After the owner has had two other students read and evaluate their work, they have time to make improvements before being graded. Google Apps is accessible anywhere there’s internet, so students can, and do, work on their assignments from home. Since I can view each student’s history, I see they are excited and engaged based on the times of day (and night!) they are working. We are a small school in a rural area. Not all students in my class have access to technology at home. It’s important they are given numerous opportunities to become digitally literate. Recently, when I ran into several of my grade 8 grads at their high school, they told me they continue to value and use Google Apps on their own. Peer editing with Google Apps helps support my students with the writing process by creating a community where students support each other. “Computing in the clouds” supports the writing process outside of school, since it’s accessible anywhere there’s an internet link. When I first started using Google Apps with last year’s class, I wasn’t sure how things would go. But we all learned together, modeling the three principles supported by Educon. Students love the process and the benefits are clear. After all, who wouldn’t want to spend their days writing in the clouds?